Couple years ago it used to be very easy to get a good idea about the popularity of the different e-commerce platforms, as almost all the companies published stats about how many people are currently using their platform. However, vast majority of the companies have now stopped publishing stats or publish them in a way that makes it seem like the brand is much more popular than it really is. One example of publishing the popularity information in a slightly misleading way is how Woocommerce currently (early 2018) publishes a stat on their homepage about how many downloads there has been - this number is obviously way higher than the number of people who are actually, currently, using it. However, there is at least one way to get decent idea about the popularity of the different platforms. Alexa.com (owned by Amazon) has a service on their website that let's users easily see how high in popularity certain website ranks either in US or globally. Due to the way the data is collected for the rankings, the rankings are not necessarily 100% accurate, but they should give a good indicator of the relative popularity of the different platforms. 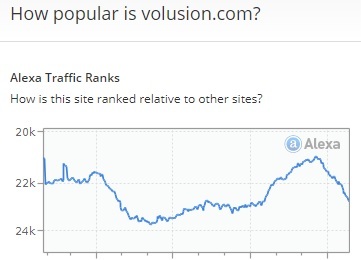 This means, that if the website which offers platform A is ranked as the 400. most popular site and another site offering platform B is ranked as the 2500. most popular website, it is highly likely that platform A is more popular than B. It is worth mentioning that visitors to a website are not the same thing as active platform users. In order to ensure that the rankings presented below are as comparable as possible, I've excluded from the comparisons the companies (or more accurately their homepages) that mainly focus in making it easy to build regular websites and only offer as an additional product an e-commerce platform. This means that I have excluded, for example, Squarespace and Wix from the comparisons. The Alexa.com stats show that the relative rankings of the researched 7 platforms are the same both in the USA as well as globally. Meaning that the same platform is most popular in US and Globally and the 2nd most popular one is that both in the USA and globally and so on. However, there are obviously some differences in other individual countries besides the USA. In India, for example, Magento is more popular than Bigcommerce, even though Bigcommerce is more popular globally and in the United States. Shopify is currently the most popular e-commerce platform both globally and in the United States. According to the stats Shopify is at the moment the 530. most popular website in the world and the 305. most popular in the USA. 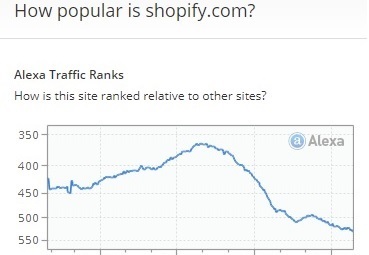 Shopify is also one of the few companies that publishes clear user numbers on their homepage. According to Shopify the are currently 500,000 businesses that use their service. This stat can be useful when trying to estimate the user numbers of the other platforms. Shopify.com's popularity globally over the last year is shown above. 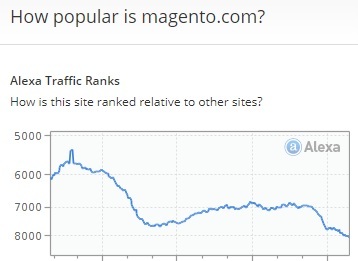 All the graphs presented below show the global popularity of the company's homepage over the last 12 months. What makes Shopify so popular? Shopify is not only the most popular e-commerce platform, but it is also that with a very wide margin. So you might be wondering what is behind its success. Probably the biggest factor is that, that the platform is just extremely easy and quick to get started with and you can easily have your own online store up and running in just couple hours. But on the other hand the platform is also so high quality that people don't really switch away from Shopify to other e-commerce platforms all that often. So to put it simply: Shopify invites potential customers in and and once they are in, they see no reason to go elsewhere. When you combine that with how many people want to start their own ecommere business, it is easy to see why Shopify is so successful. Launch your e-commerce store now with Shopify. 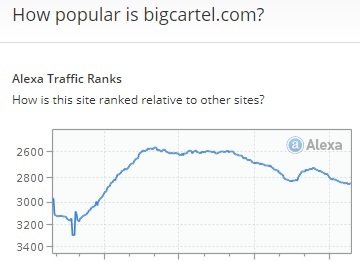 According to the stats bigcartel is currently the 2846. most popular site globally and 1218. most popular in the US. 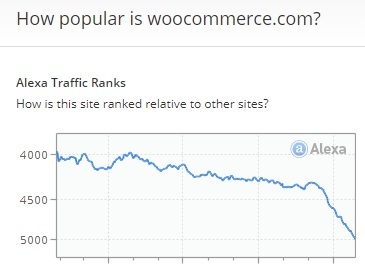 Woocommerce is currently the 4998. most popular website in the world and 4896. most popular in the United States. At the time of writing this Magento is the 5. most popular service and has a website ranking of 8,073 in the world and 6,925 in the US. 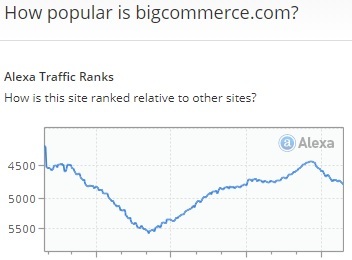 3dcart is at the moment the 7th most popular ecommerce solution. 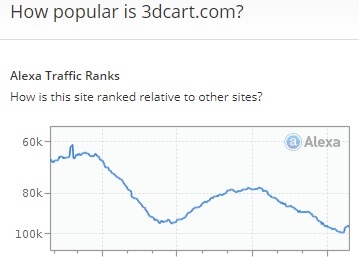 The 3dcart homepage has a website ranking of 96,860 globally and a website ranking of 33,104 in the United States.